The latest issue of Counter, the first under the new management of Greg Schloesser and Ben Baldanza, landed on the doormat today. As you’ll see from the picture below, the magazine has trimmed down a bit (not quite as wide as a standard A5 paper size, unless my copy got trimmed a bit more than it should have). However, the page count and content looks just as good as always. 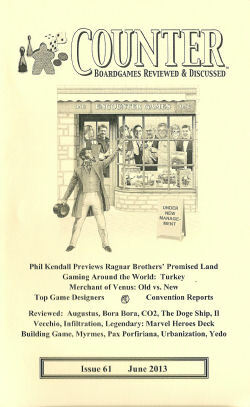 This issue has reviews of SdJ nominee, Augustus, as well as Bora Bora, CO2, Legendary: A Marvel Deck Building Game, Pax Porfiriana and lots of others. Subscriptions and further info is available here. Well, after last weekend’s little Feld joke, here’s another. This, however, is only a slight joke in relation to the word “new”. 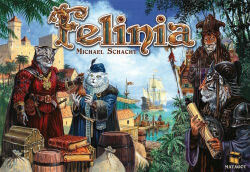 The Works has got some new games in and this includes Michael Schacht’s Felinia (a 2010 release) which I’ve not played before. Jan had a look in the Shrewsbury branch today and… success! They had copies of this, Giants and Industry so she picked up the first two for me (as I already have the earlier 2003 version of Industry – Industria – also by Michael Schacht). 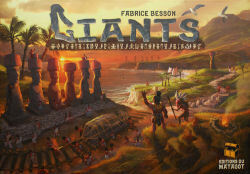 Giants, like Felinia, is a game from publisher Matagot (although from 2008 this time) and looks very nicely produced. Hope to play them soon. I went along to the UK Games Expo this morning and, as I was wandering around, I spotted a Feld game that I didn’t have and, even better, it was reduced in price from Â£49.99 to just Â£10.00. Now before Nige explodes in anticipation, I have to point out that this was not a Stefan Feld game; rather it was a Friedemann Friese game called Furstenfeld. This was released in 2010 but looks quite good – just not worth the Â£50 full price. I also picked up Forbidden Desert and the mini expansion to Key Flower. Just a reminder that UK Games Expo is this weekend. It takes place between 24th and 26th May at the NEC Hilton Metropole. The main show days are on the Saturday and Sunday but the Friday is reserved for playing games. All the details are on the Expo website. Came home to find two parcels had arrived for me today. The first was from Amazon and was a new Reiner Knizia game, The Hobbit: An Unexpected Journey – Das Kartenspiel. This is a refinement of King’s Gate and ported to Middle Earth to tie in with the film. The second was a copy of Wettstreit der Baumeister, a 1998 Kosmos game from Jean du Poel, that I was reminded about when I was researching this month’s Wayback When? I have fond memories of this. As usual, the Spiel des Jahres jury threw up some surprises in the choice of nominees for this year’s awards. For the main award, the nominees were Qwixx, Hanabi and Augustus. This is really odd as two of the games are small box card / dice games and, as the aim of the award is to promote the industry, the SdJ logo is not going to show up very well on such a tiny box if Hanabi or Qwixx win. For this reason, I’ll be astounded if Augustus doesn’t win, added to which it seems the only one with expansion potential. I’ve played both Hanabi and Qwixx and they are both decent games. Hanabi is a clever design but needs the right group of people to make it shine. I’m not sure it’s one for a typical German family. Qwixx fits the family game mode and is sort of a variant of Sid Sackson’s Choice. It works quite well and is an interesting choice of nominee and I can understand why it got the nod as you can jump right into the game in a matter of a couple of minutes. Not played Augustus but the reports made it seem like a likely choice. Turning to the Kennerspiel des Jahres nominees (Brugge, Palaces of Carrara and Legends of Andor), I expected a Stefan Feld game to be nominated but thought it likely that the more straightforward Rialto would be chosen. Nige suggested Bora Bora, which I thought too heavy, so the jury instead picked Brugge which I think falls between the two. I’ve not played the game yet but look forward to the Z-Man English release in a couple of months. Palaces of Carrara is a game that I rate very highly so I’m not at all upset to see it nominated but it is a bit of a throwback to designs of ten years or so ago, hence I expected it to be overlooked. More fool me. Legends of Andor is a fairly decent choice as it is a co-operative game with multiple scenarios that ease the players into the full rules stage by stage. Could be good but I’ve not played it although the recent video run-through by the folks at BGG didn’t really grab me. On the recommended list, I wasn’t surprised to see Tzolkin appear but was glad Terra Mystica also get recognition. Mark K has a copy on order so I’m keen to see what it’s like. There is some nice variety in the games chosen and those that I’ve played (Rondo, Riff Raff, Escape, Divinare and Libertalia) are all worthy of appearing. La Boca seems to have been many people’s favourite to win and also looks a solid game although I’m not sure about replayability. Yay! (a dexterity dice game), Mixtour (a two-player abstract) and Hand aufs Herz (a party game) I have no idea about as I’ve not played themÂ but IÂ had never even heard of them until this morning so interpret that as you like. The winners of both awards are announced on 8th July. The jury of the Spiel des Jahres have decided the shortlist for this year’s award should be Qwixx, Augustus and Hanabi. Meanwhile the Kennerspiel des Jahres (gamer’s games) nominees are Legends of Andor, Palaces of Carrara and Brugge. The list of recommended games is Riff Raff, Rondo, Yay!, La Boca, Escape, Mixtour, Hand aufs Herz, Divinare, Libertalia, Terra Mystica and Tzolkin. Some surprising choices as usual. I’ll give some thoughts on the list this evening. Author Garry LloydPosted on 21st May 2013 Categories SnippetsLeave a comment on And the nominees are…. Recommended list – Saint Malo, Rondo, Wurfel Bohnanza, Hanabi, Star Wars: Angriff der Klonkrieger, Spectaculum, Tokaido, Legends of Andor, Farmerama, Palaces of Carrara. Played a good two player game of Notre Dame last night. Works really well with two and finished well within an hour even though it was Jan’s first play. Sad to say, she beat me 50-40 as she made good use of the VP-generating area (the Residence), while I had one or two problems controlling rats. 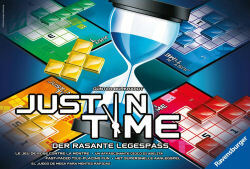 Just in Time is a competitive puzzle game designed by Gunther Burkhardt and published by Ravensburger. It is in the same mould as Ubongo and FITS (the latter also a Ravensburger game) but is different enough that fans of this type of game should give it a try. The game comes with 52 pentomino plastic tiles, thirteen each in four different player colours andÂ 40 game boards (four sets of ten identical boards in the player colours). Then there are 27 challenge cards, nine of each showing three, four or five different shaped pentominos, plus a scoring track and a 30 second sand timer. The plastic tiles are of good quality but the game boards, cards and scoring track are made of fairly thin coated card rather than being the thick cardboard tiles I had expected. I don’t think it affects gameplay or how long they’ll stand up to repeated play but it may come as a slight surprise based on the usual quality of Ravensburger’s components. The game is played over ten rounds with players in each round using the same game board. Each board is rated 3,4 or 5 and this illustrates how many pentominos must be placed within a grid of multiple squares set out in a particular shape. Some of the squares in the grid also display a number. A challenge card of a number matching the board rating is turned over and this indicates which pentominos the players must use for this board. One player shouts “Go” and players try to fit all the pentominos into the grid, while trying not to cover number squares if they can. Once a player has done this, they shout out the sum of uncovered numbers in their grid and everyone else has 30 seconds to complete their grid but they are not allowed to leave the same sum of uncovered numbers as those players that manage to finish and shout their scores before them. Once time has run out, anyone who didn’t complete their grid fails to score and everyone else scores the sum of their uncovered numbers. This is repeated over ten rounds and whoever then has the highest score is the winner. This is a pretty typical puzzle game and often there will be players that can easily visualise a solution and those that cannot. This makes for a dull experience for those that fall into the latter group. However, there is a catch up rule that I’ve not mentioned yet and this does help to level the playing field a bit. If, at the end of a round, you are ten or more points behind the leader’s score, you get to use a smaller square tile as a replacement for an awkward shaped tile. This does make the puzzle quite a bit easier and can put the pressure on other players if you’re able to quickly solve a grid. This ought to ensure people stay in reasonable contention throughout the game, although the more spatially aware players are still more likely to win. Just in Time is a good addition to the puzzle type game but it’s not a great addition. There are other games I would probably choose before this, such as FITS or Take It Easy, but for those who are hooked on this type of game, it does make an interesting change and the race element does make it quite tense. It is a very straightforward game so easy to play with the family or occasional gamers. It’s probably not one to play with hardened gamers though.